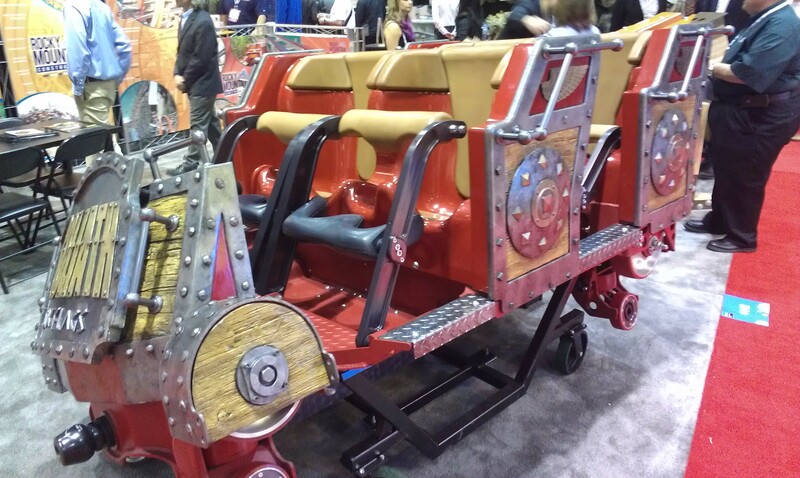 In 2000, as part of a settlement after Paramount had issues with the Phoenix Rides (the high tech ride division of Premier Rides at the time) 1996 Flight of Fear, Premier had to design trains for a unique wooden roller coaster. Known as the Son of Beast and installed at Kings Island (Mason, OH), this giant roller coaster was the tallest and fastest ever built out of wood. It would also include a giant 118 feet loop. So, Premier had a huge challenge in front of them. The solution? A heavy 6 cars train that would have 3 rows per car. 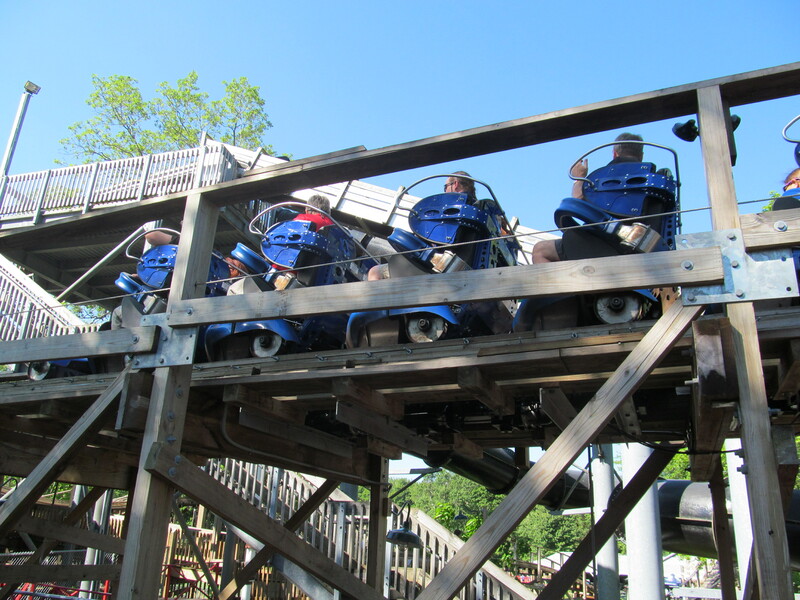 In order to navigate the loop and the tight turn, the front axle was moved back, so the cars have a neat almost Wild Mouse configuration. The shorter wheel base allowed the train to navigate the “Rose Bowl” helix and the loop. Standing 218 feet tall, the ride featured a record breaking 214 feet drop and the train reached 78 mph at the bottom. Those speeds necessitated a custom wheel configuration in order to take the extreme heat generated. The solution was massive 12 inches wide steel running wheels. Riders were restrained using the combination of a bucket seat and a mechanical U bar with a large upper section. The upper section kept riders in an optimal position during the loop and that along with the chin bar made the restraint class 5 compatible. This means that even if the train got stuck upside down in the loop, the restraint would secure the rider in place. In 2001 and 2002, this restraint was retrofitted to the Phoenix Rides LIM roller coasters. It improved those riders greatly and made them instant crowd favorites. 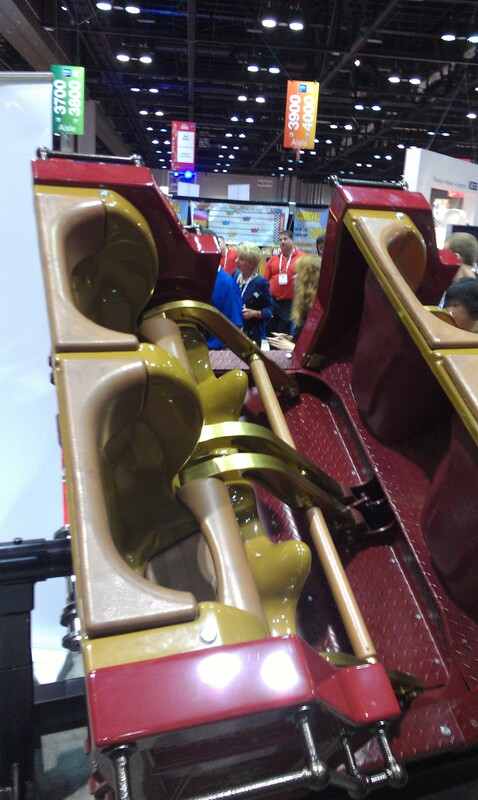 The restraint used on the wooden coaster train, Dark Coaster and LIM Coasters at Premier Rides. The car high sides helped make this train Class 5 compatible, capable of going upside down. This picture appears courtesy of http://movieparkgermany.de/de. 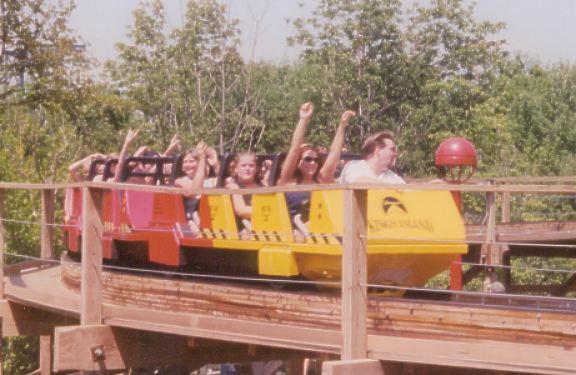 In 1991, at the request of Six Flags, Bolliger & Mabillard designed 3 new trains for a Dinn-Summers wooden roller coaster. The Psyclone opened at Six Flags Magic Mountain (Valencia, CA) and was a mirror image of the classic Coney Island Cyclone. It could run two trains at once, but in order to keep maximum capacity during the off season, the park bought three trains. The cars mechanically are near clone of the PTC Articulating two bench trains. Restraint wise, it is a simple hydraulic individual L bar. The ride was demolished in 2008, but the trains ran on the Colossus at the same park annually until 2013. 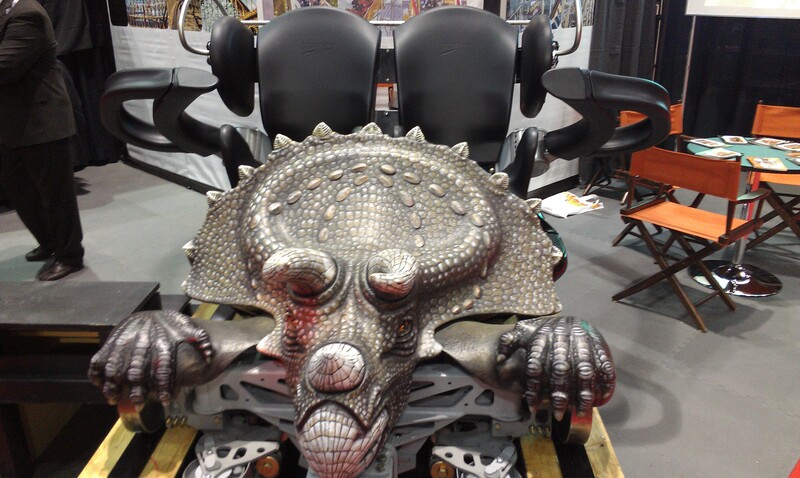 Due to the headrests on the cars, they were perfectly capable of safely running backward and so, the park took them out of storage every October and in the summer of 2013 for the Backward Colossus. The trains will probably be scrapped now as the Colossus closed permanently. This picture shows the bucket seat and restraint. 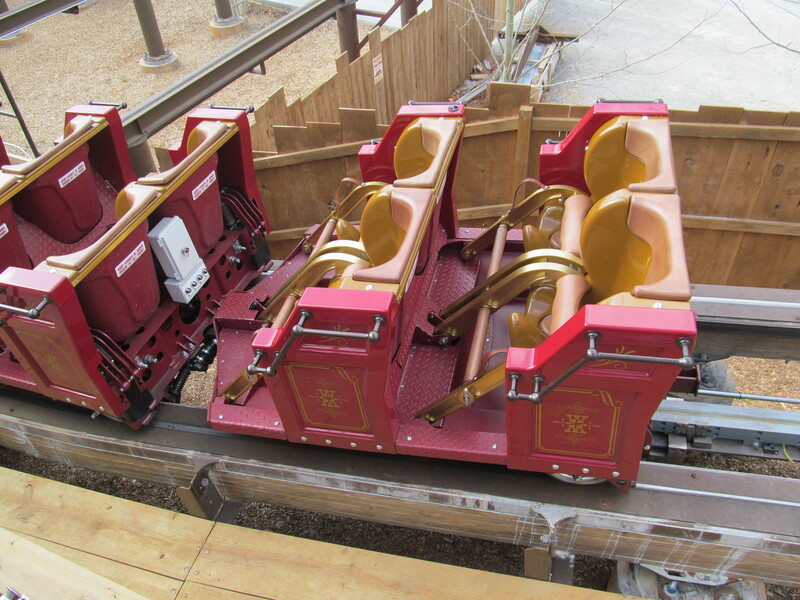 In 2008, The Gravity Group (TGG) announced they had designed their own wooden coaster car and would manufacture them through a sister company called Gravitykraft. Featuring a trailered single bench design, it was designed to go through the tightest turns and curves while minimizing impact to the track. 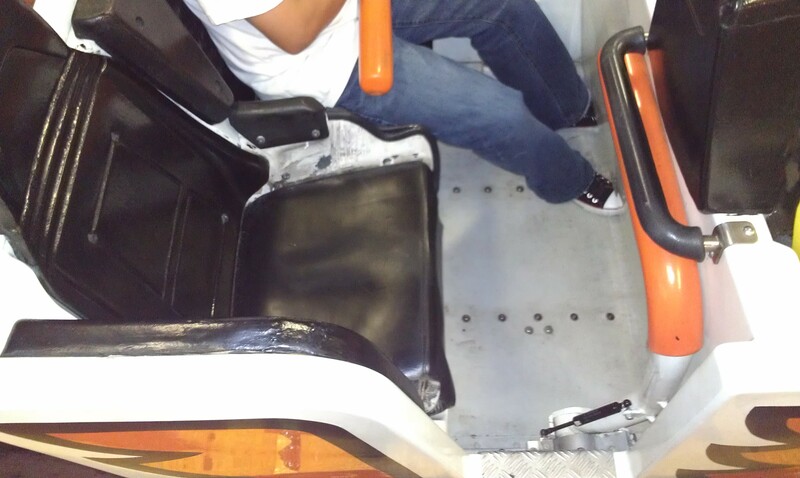 They were designed to reduce maintenance and for that purpose, the ergonomic seats can be lifted by the maintenance workers in order to access the chassis. The restraints are hydraulic Class 5 compliant lap bar that swing over from the side and secure riders without requiring a seat belt. Shock absorption was also designed in for the wheels. 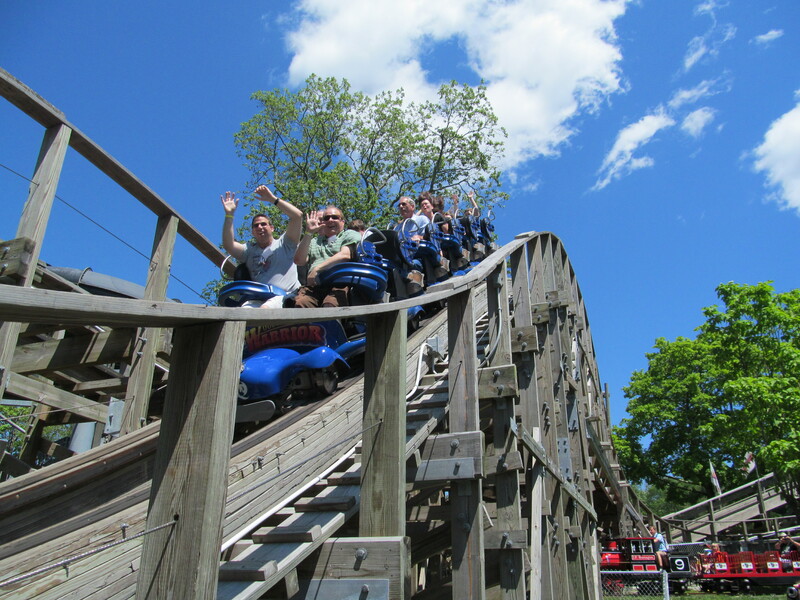 The ride capable of taking riders upside down, as demonstrated on the Hades 360 roller coaster at the Wisconsin Dells, WI theme park, Mt. Olympus. 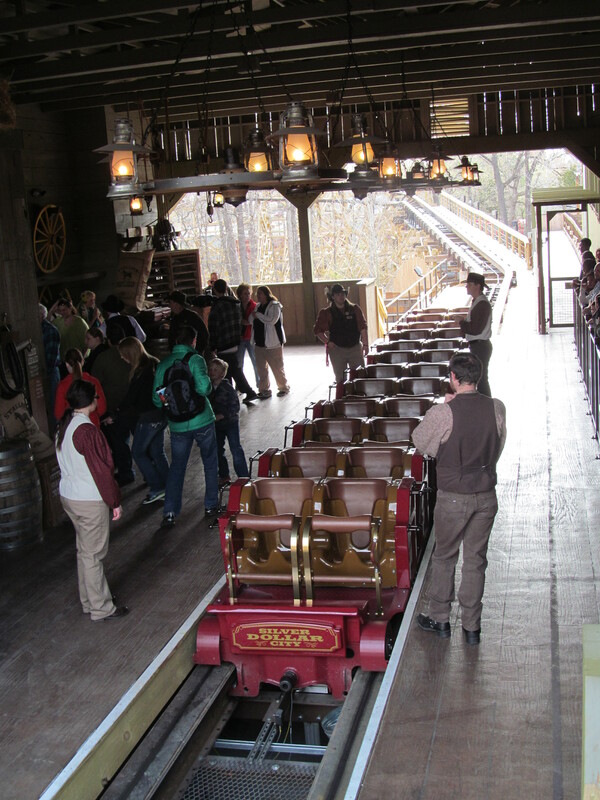 A close-up of the Timberliner train on Wooden Warrior. The train here has six cars. 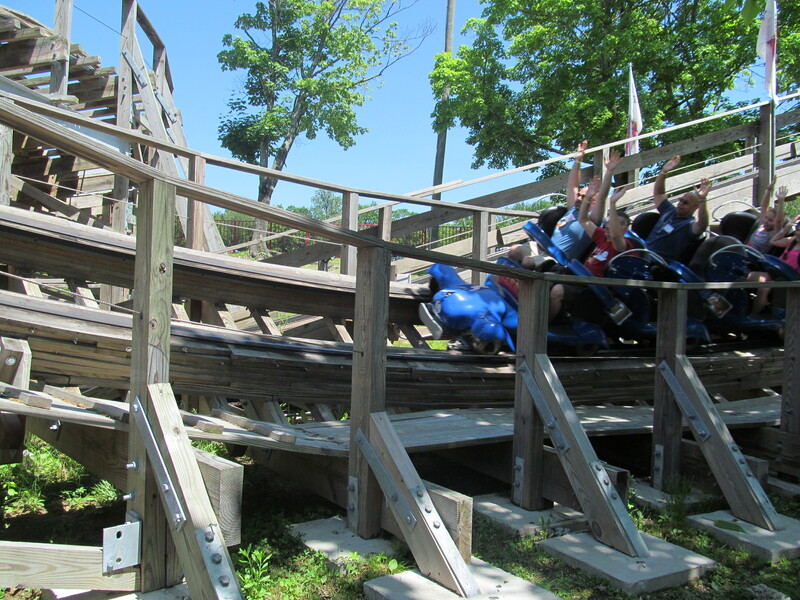 The Timberliner train in action on the Wooden Warrior at Quassy Park (Middlebury, CT). The design that eventually became the Roar-O-Saurus train at Storyland (Glen, NH). After building the wooden roller coasters at Coeur D’Alene, ID Silverwood amusement park, Jeff Grubb and his wife launched in 2001 Rocky Mountain Construction (RMC). 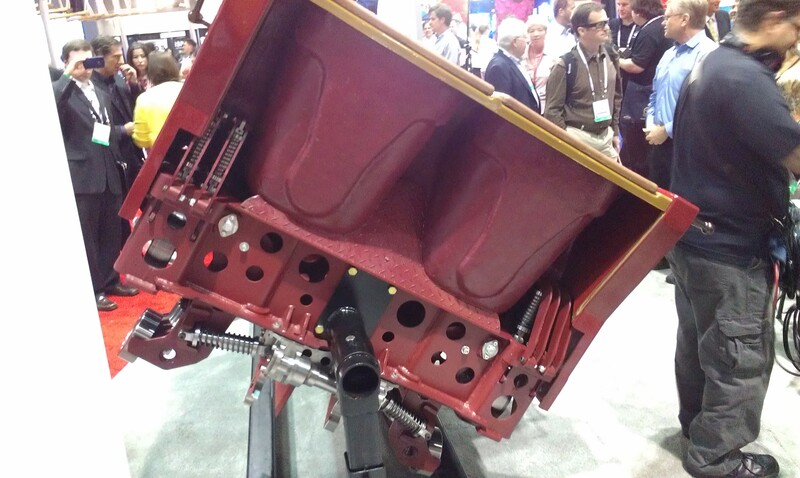 Their specialty is high quality construction of amusement ride. They are the de facto builders at Silverwood and have worked around the world on various projects, such as the Intamin award winning El Toro and T Express roller coasters in New Jersey and South Korea respectively. 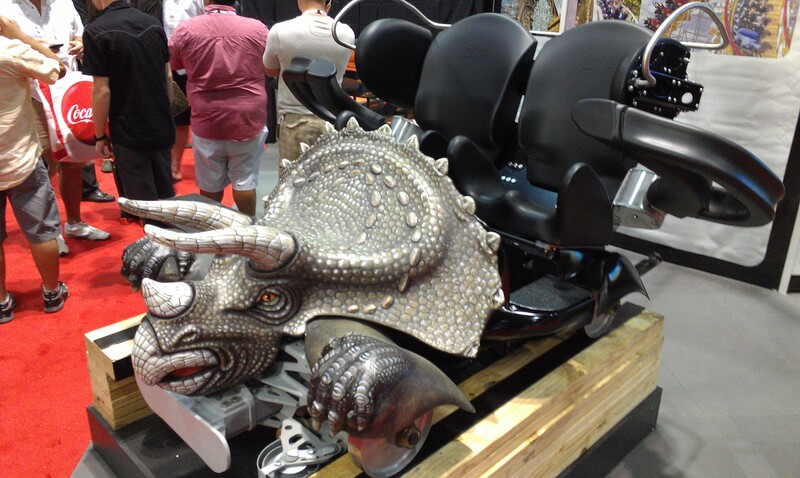 In 2011, they hired Alan Schilke (previously from Arrow Dynamics) to design both rides and new ride cars for them. The first collaboration was the New Texas Giant at Six Flags Over Texas (Arlington, TX), but that ride featured 3 Gerstlauer Hybrid trains. 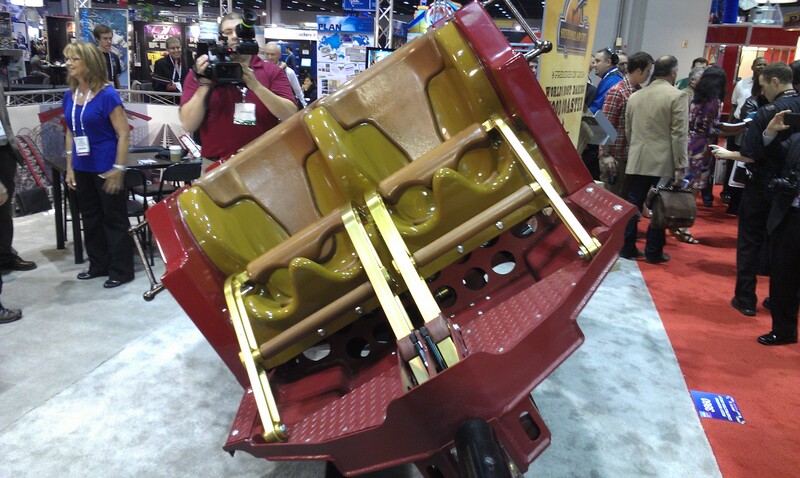 In 2012, they introduced the Gen One wooden coaster cars, which feature class 5 restraints, a light weight steel chassis and ergonomic seats. The wheels feature a suspension and are spring loaded to follow the track. That in combination with their Topper Track and I Box track solutions provides the smoothest and most comfortable rides ever. 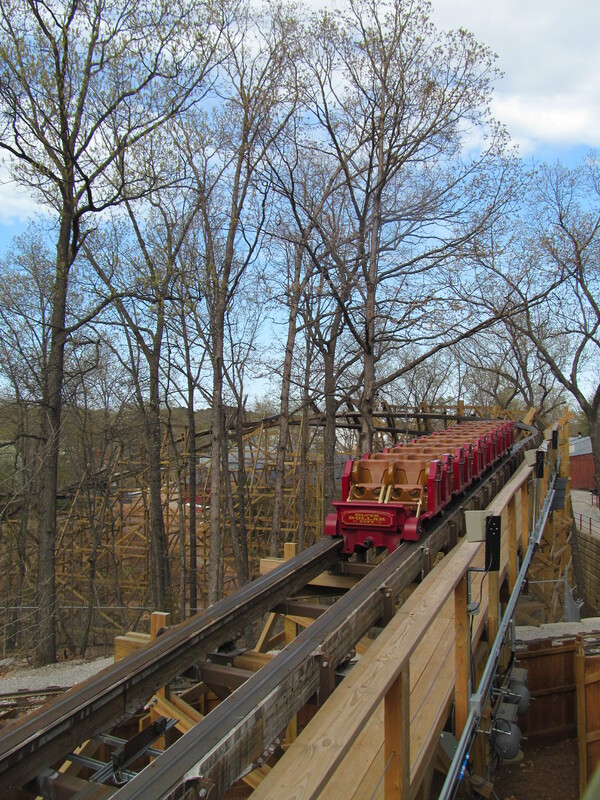 The first Gen One installation was on the Outlaw Run at Silver Dollar City (Branson, MO). The cars were well received, but the shin bars designed to secure riders legs were uncomfortable for taller riders. 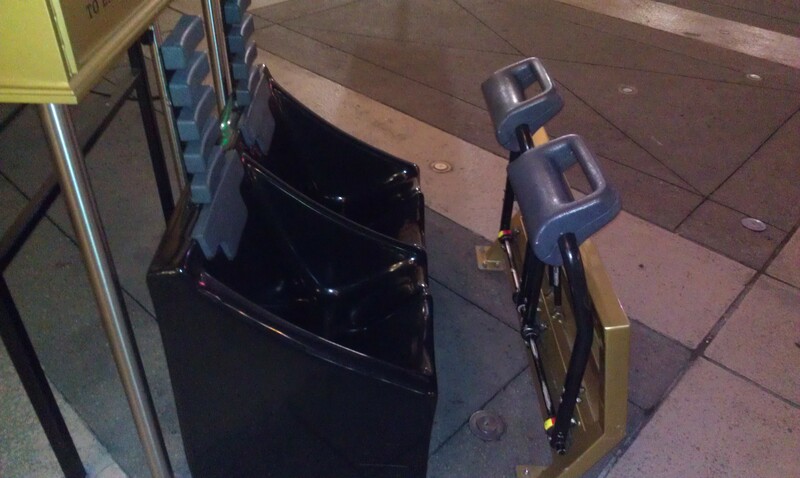 They were redesigned for the two new 2014 installations and Outlaw Run retrofitted as well. Backside of the car. Notice the suspension and spring loaded axles. The seats. Notice the original straight shin bars. Goliath at Six Flags Great America (Gurnee, IL) front car. Notice the redesigned shin bars. This entry was posted in Coasters and tagged B&M, Bolliger & Mabillard, Gravity Group, Intamin AG, Kings Island, Kumbak, Movie Park Germany, Premier Rides, RMC, Rocky Mountain Construction, Silver Dollar City, Son of Beast, Storyland, Warner Brothers Movie World, White Cyclone. Bookmark the permalink.